Replacement parts or tokens for the board game RISK. Tokens only, no box, no board, no cards, no instructions. This listing is for replacement tokens or pieces only for the board game RISK. There is no box, no board, no instructions, just little soldiers. The pieces are in plastic containers. One container has a crack across the top. I don't know how many pieces were in a game and can't find a listing that states the items. I counted the different tokens and colors and have listed the results below. The tokens, in their individual plastic cases and in a shipping box, weigh one pound and four ounces. By postal rules that weight has to be rounded up to the next pound, making the shipping weight 2 pounds. 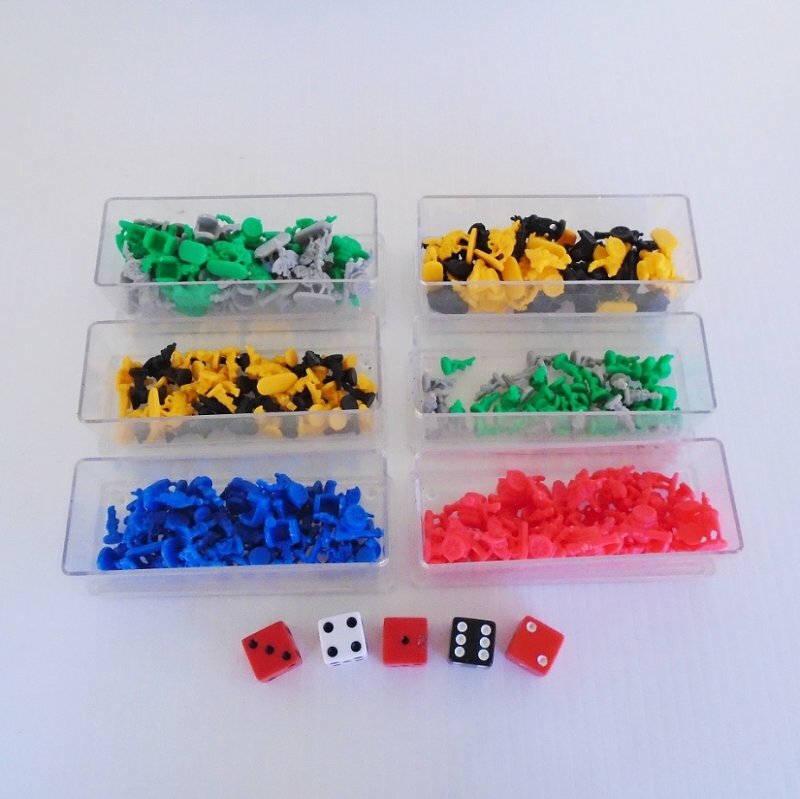 If you are buying these to add to your game, or to replace lost pieces, you probably already have the plastic boxes. IF you do not need the plastic boxes, the tokens will be able to mail out at around $6.00. If you don't need the plastic boxes let me know and I'll be glad to give you an accurate shipping cost for First Class mail delivery. That being said, buyer to pay no more than $10.95 for Insured USPS Priority Mail delivery charges, again, possibly less depending on your location.